The largest and most affordable Online Women's Bicycles Shop! Women's Bicycle shop the largest and most affordable! Do you want to buy a Women's Bicycle online? Hollandbikeshop.com has the Women's Bicycles you’re looking for. Women's Bicycles are characterized by their straight down tube and single curved top tube. The lack of a horizontal top tube allows women in skirts and dresses to get on their bicycles without a hitch. Also, Women's Bicycles are constantly being improved. A robust steel frame and sturdy lock are part of the package nowadays - although Women's Bicycles are made with heavier materials anyway, so that the lack of a horizontal top tube doesn't impact the safety of the bicycle. These Women's Bicycles that can take a punch are genuine lifestyle bicycles because of their striking colors and the hip prints on their fenders and chain guards. At Hollandbikeshop.com you can find a wide choice of Women's Bicycles by brands like Excelsior, Cortina, Batavus, Gazelle, Victoria, Johnny Loco, Bikkel, Union and Lief!. In our wide Women's Bicycle range on Hollandbikeshop.com you can find modern and nostalgic Women's Bicycles in various colors, sizes and models, like Women's Bikes with or without gears, with a coaster brake or hand brake, Women's Bikes for cycling tours or for daily use and Women's Bikes with a front carrier or luggage carrier. So you'll surely find a Women's Bicycle that fits your needs exactly. 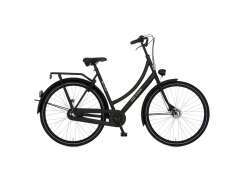 Hollandbikeshop.com is dealer of Women's Bicycles and has a large and affordable range. We also often have Women's Bicycles on sale or in our outlet, so keep an eye on our sale button. The largest and most affordable online Women's Bicycle shop!